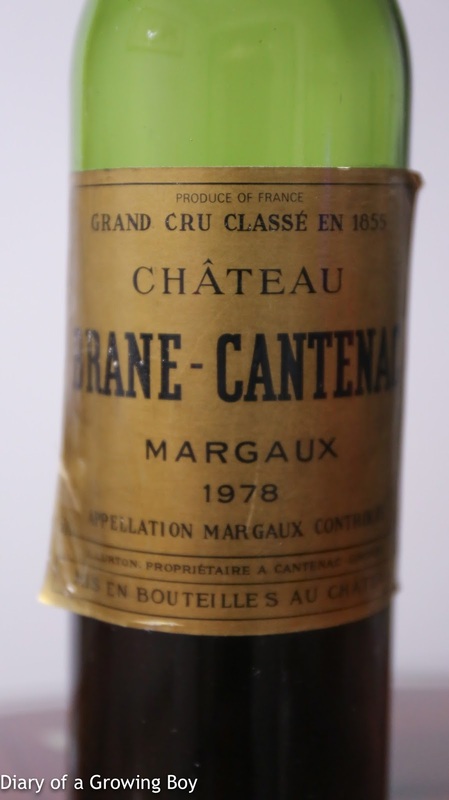 1978 Brane-Cantenac - obviously been kept in poor condition, since a wine of this age shouldn't be at low-shoulder level. Color was very light thanks to an abundance of sediment at the bottom of the bottle. Initially very sharp and alcoholic on the nose, and definitely more than a little musty and stinky. The musty elements cleared up with some aeration in glass. Oxidized and caramelized nose, almost date-like, with some nutty, earthy, animal, and leather notes. 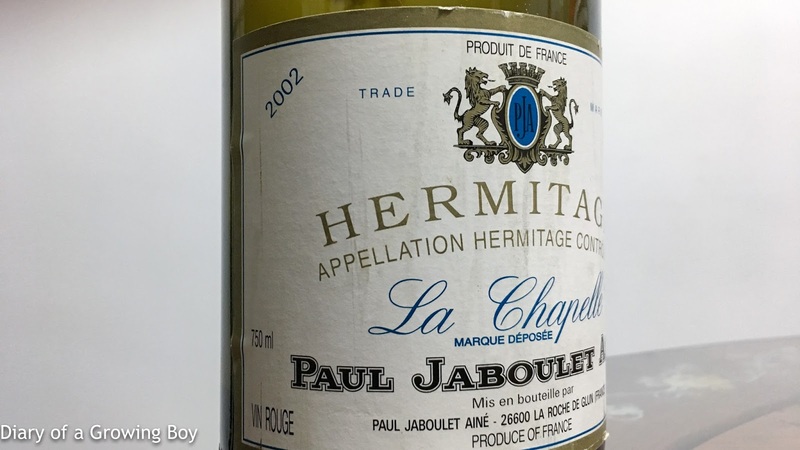 2002 Jaboulet La Chapelle - some exotic spices, perhaps with a little vanilla? Sweet fruit, cedar, smoky, and toasty. Almost a little dusty. 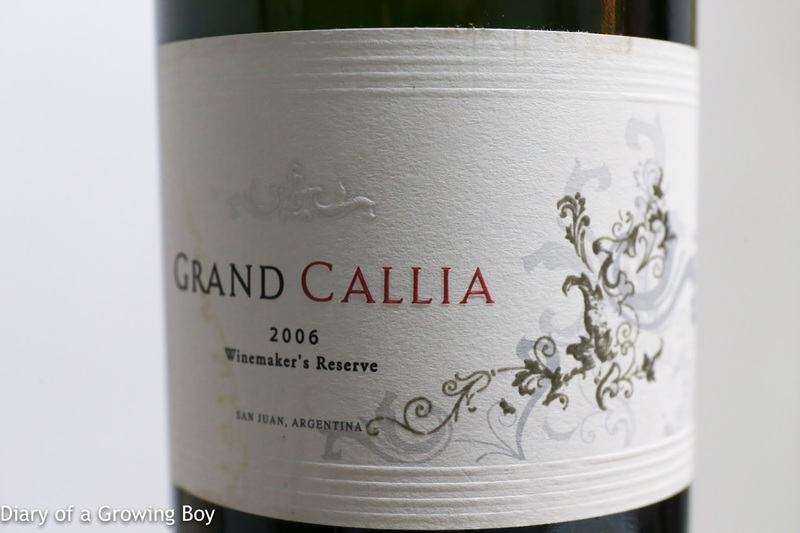 2006 Bodegas Callia Grand Callia Winemaker's Reserve - very ripe and sweet on the nose, with prominent coconut and vanilla notes. 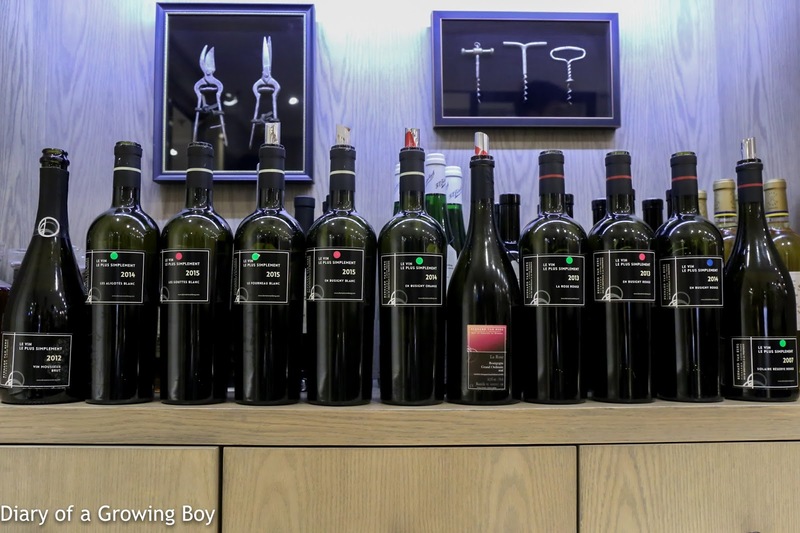 Tasting of Bernard Van Berg's wines at Ginsberg+Chan Wine Merchants Asia. 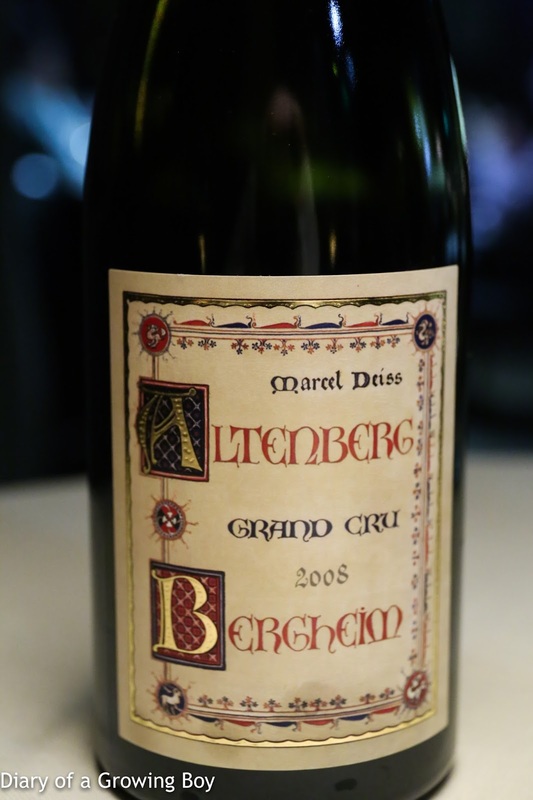 I had never heard of Bernard Van Berg until my friends from Ginsberg+Chan brought a bottle of the 2006 Rosé to dinner about 6 months ago. My memories were a little vague, but the overall impression was positive. Since then I became a little more curious about this winemaker, and finally decided to buy a few bottles for myself. When I found out about this opportunity to taste more than 10 different offerings in one go, I jumped at the chance and signed up. The wines are unusual, to say the least. 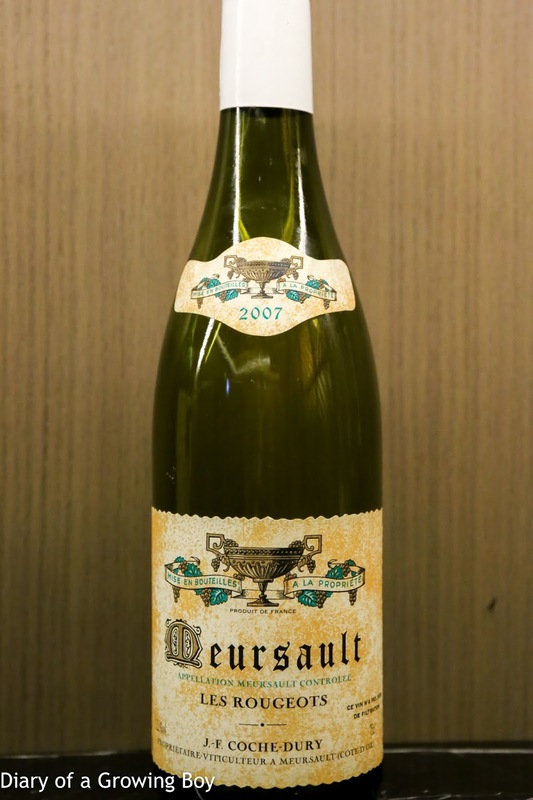 Pinot noir planted in Meursault, which meant it could not be classified even at the village level but only at the regional level formerly named Bourgogne Grand Ordinaire. 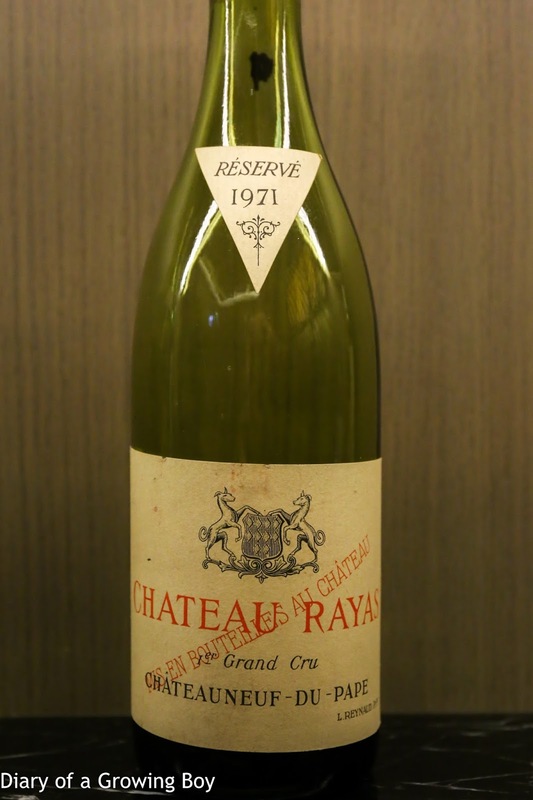 In the last few years the wines were declassified even further to the Vin de France designation. Production is ridiculously small. 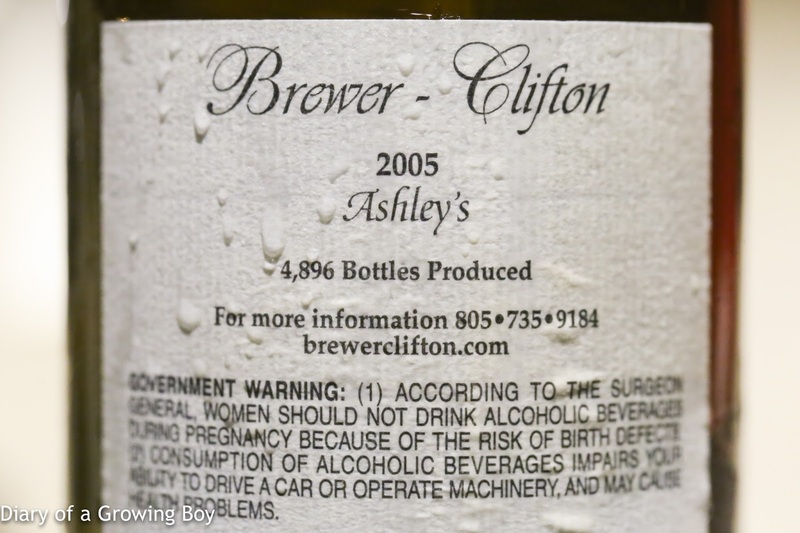 I believe all of the wines have productions of less than 300 bottles, and a few are below 100. 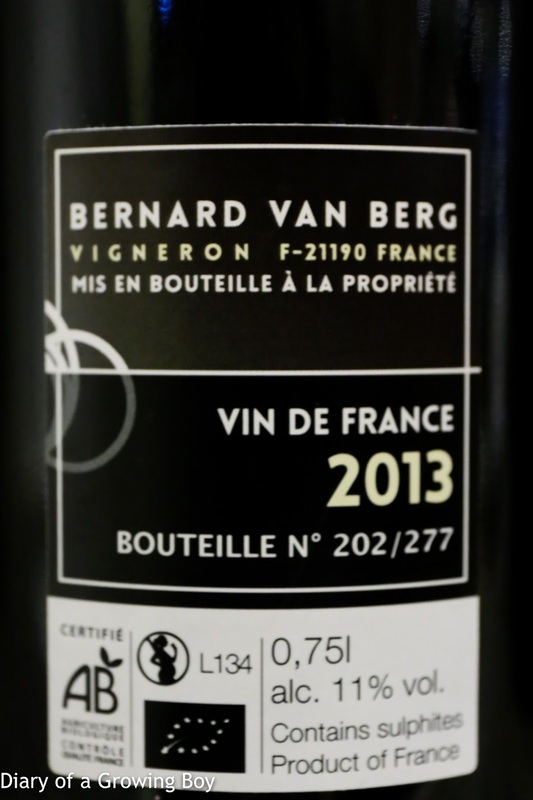 Naturally this means that most of my friends have never heard of Bernard Van Berg, let alone seen a bottle. 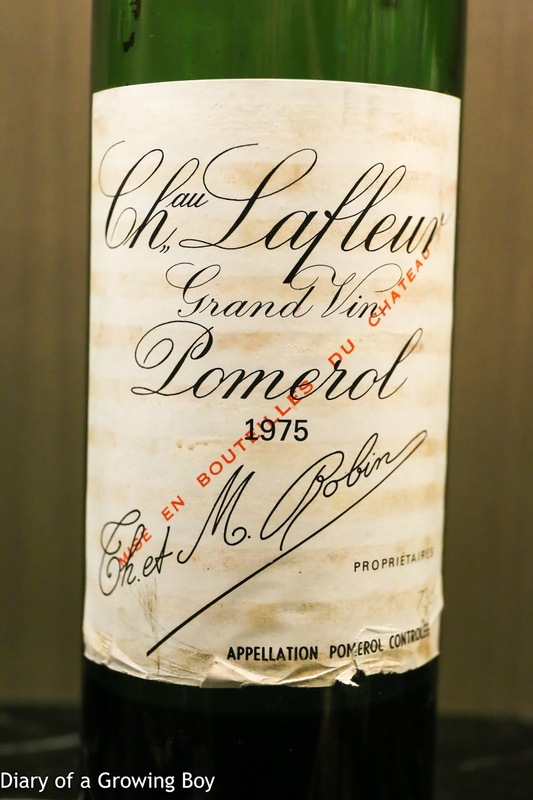 The rarity factor - along with the winemaker's reluctance to sell some of his wines - combined to inflate pricing to levels that would ordinarily seem outrageous for a Vin de France. 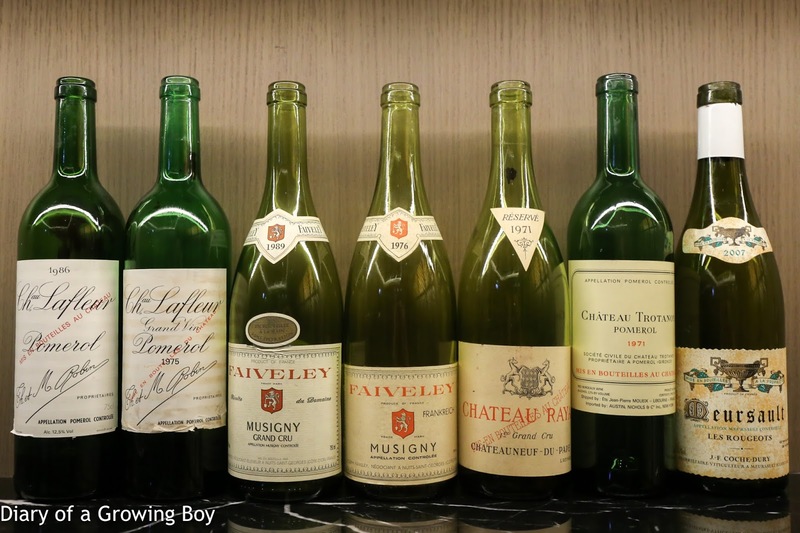 A few friends tried and found the young wines too simple. Some took one sip and poured the remainder of the glass down the drain. 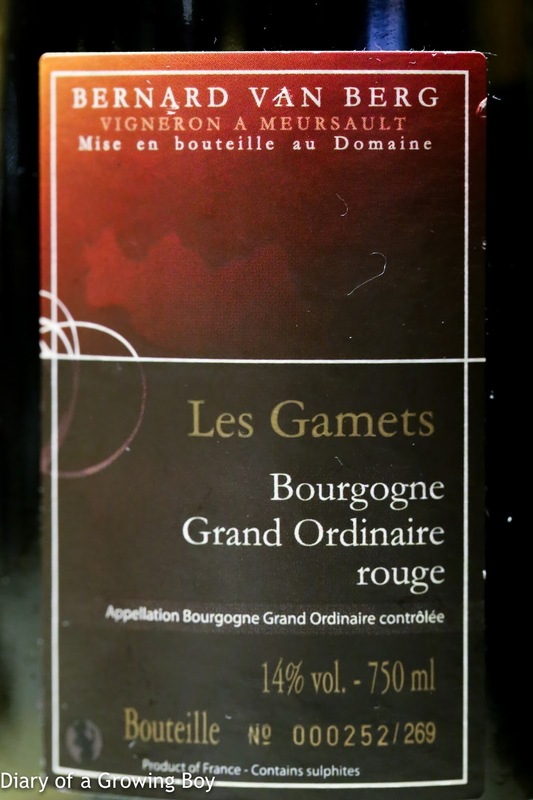 I opened up a 2009 gamay last week, and thought that while it was delicious and reminded me of a well-made Morgon from Jean Foillard, it was perhaps slightly lacking in complexity. All this meant that tonight's tasting would provide me with the opportunity to form a definitive opinion about these wines once and for all. Are they overhyped? 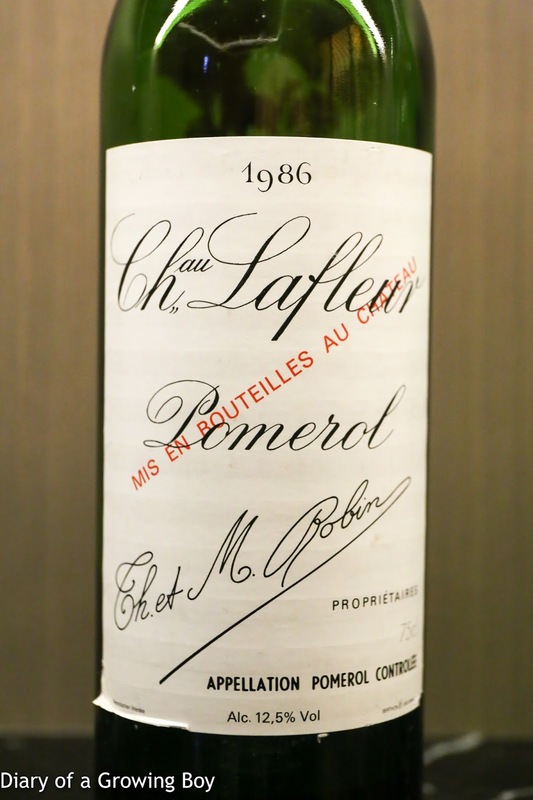 Would I be happy paying the prices that the wines are currently commanding - which are certainly a result of their incredible rarity? I was about to find out. 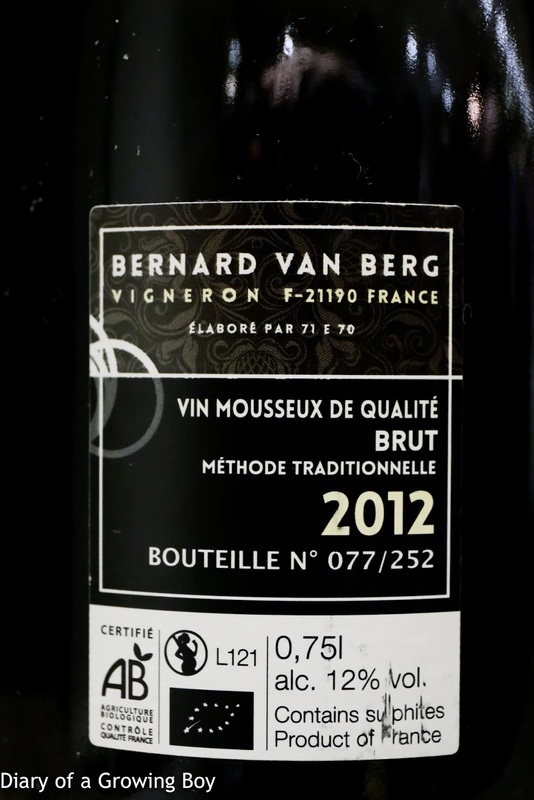 2012 Bernard Van Berg Vin Mousseux Brut, dégorgée an Novembre 2015 - opened just prior to serving. Very unusual nose, showing pine needles and some sort of potpourri fragrance. Ripe on the attack but acidity showed up mid-palate. Made with aligoté grapes from Les Gouttes in Meursault, from vines planted in 1985. 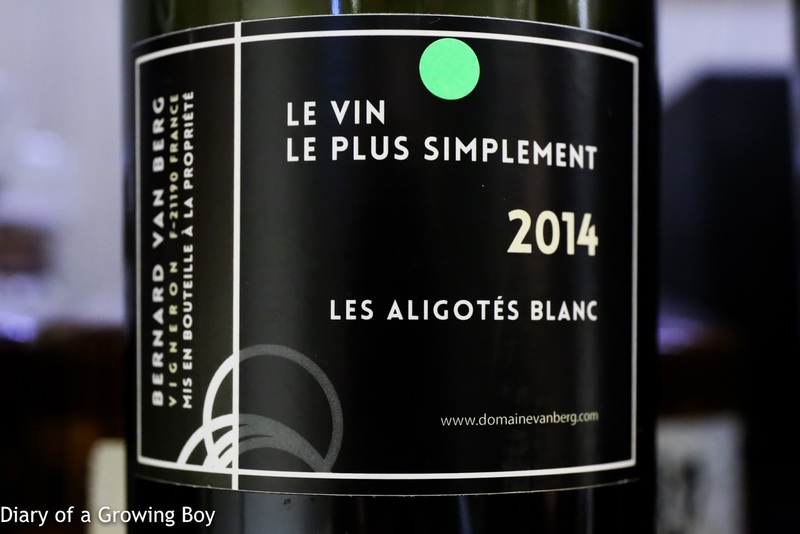 2014 Bernard Van Berg Les Aligotes Blanc - opened 2 hours prior to serving. 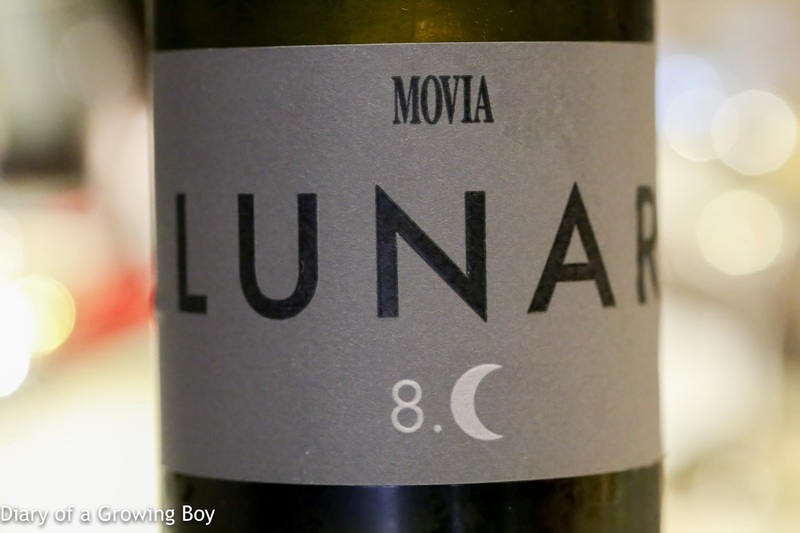 Very fragrant and exotic nose, with anise and spices, almost a little white pepper. Ripe on the nose. 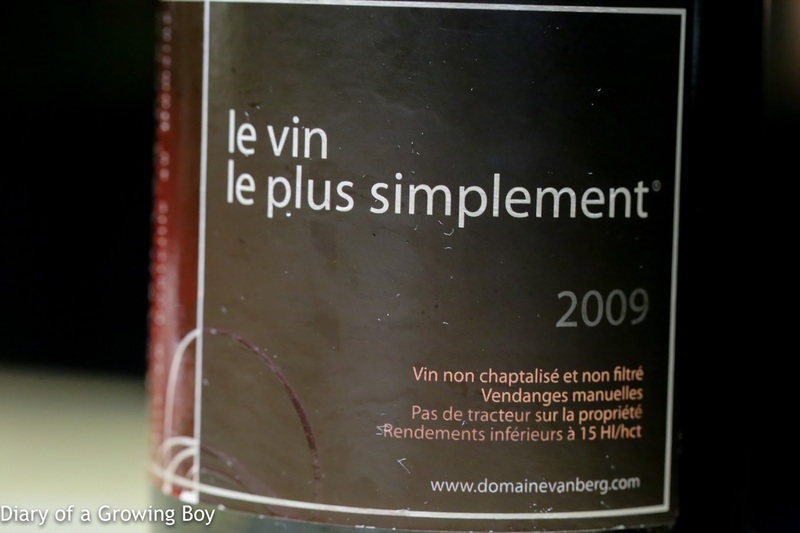 Palate was pretty flat, very soft, with very little acidity and a short finish. 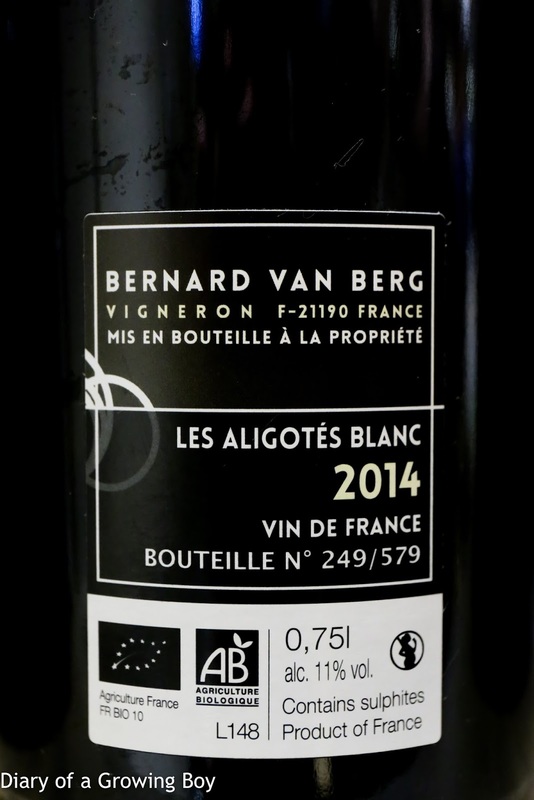 Made with aligoté grapes from vines planted in 1968 in Saint-Aubin. 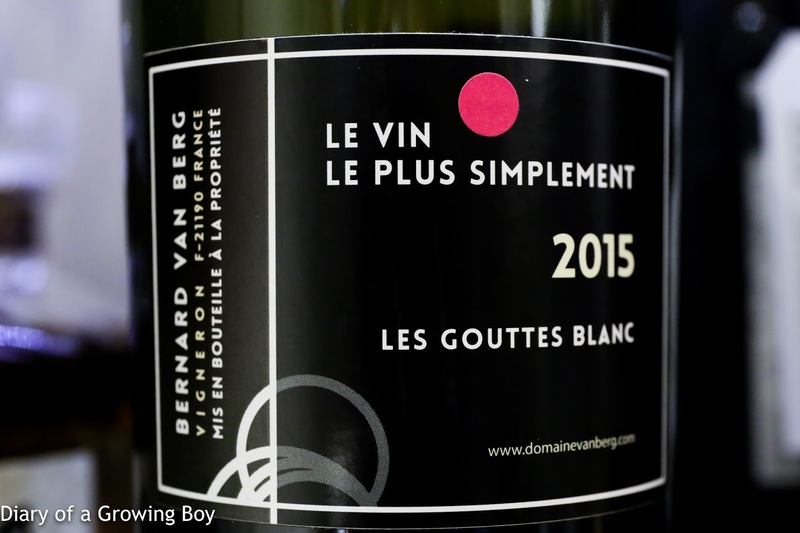 2015 Bernard Van Berg Les Gouttes Blanc - opened 2 hours prior to serving. Really big nose, with forest and potpourri notes, almost juniper, along with spices and a hint of anise. 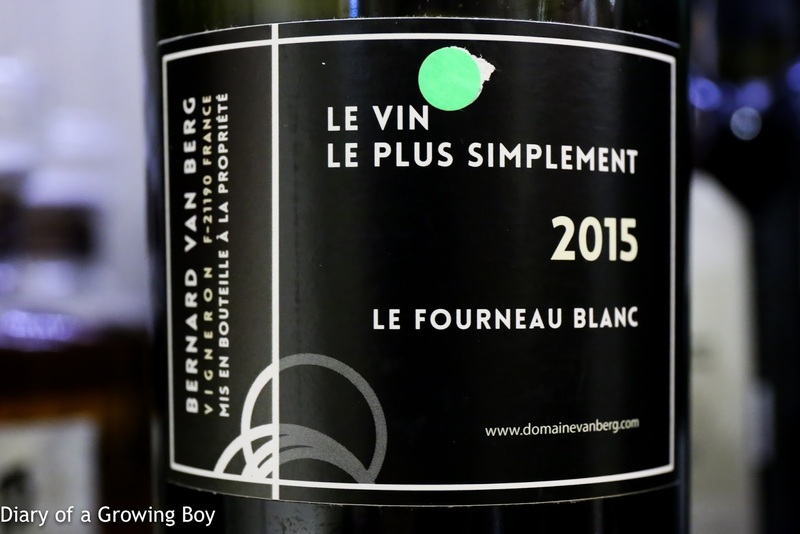 Lots of flint and minerals, with a hint of Anjou pear later on. Nose was very complex, but the palate was again very soft, with a little more acidity on the finish. Made with aligoté grapes from Les Gouttes in Meursault, from vines planted in 1985. 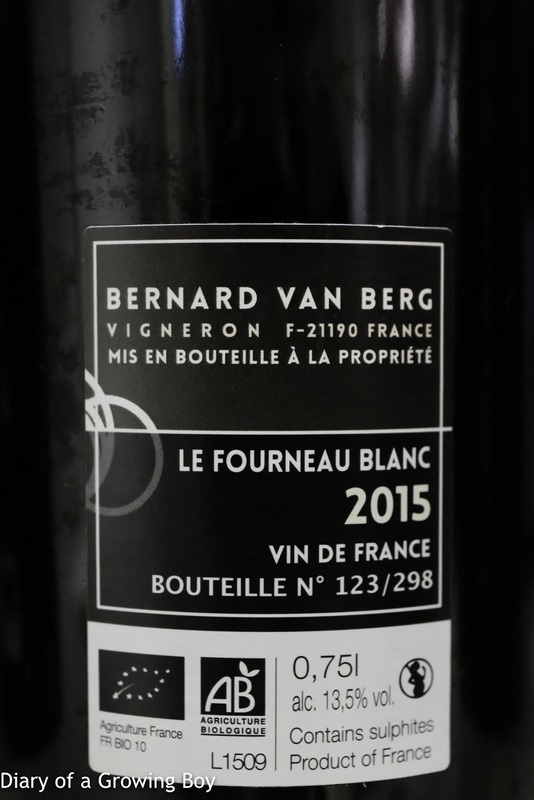 2015 Bernard Van Berg Le Fourneau Blanc - opened 2½ hours prior to serving. Huge nose of toast, basically like a piece of burnt and charred brioche... showing some sweetness from the butter. More body here and a little hot on the finish, but still not much length here. Made with chardonnay grapes from vines planted in 1990 in Chagny. 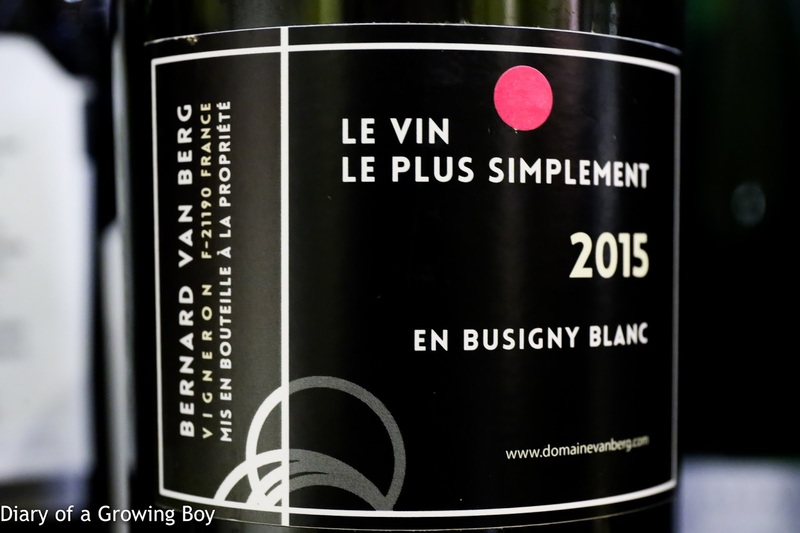 2015 Bernard Van Berg En Busigny Blanc - opened 2½ hours prior to serving. More steely and lean on the nose, with toasty corn. Good ripeness on the palate but there is higher acidity with a longer finish. Very nice, and almost reminiscent of a Coche-Dury Meursault. 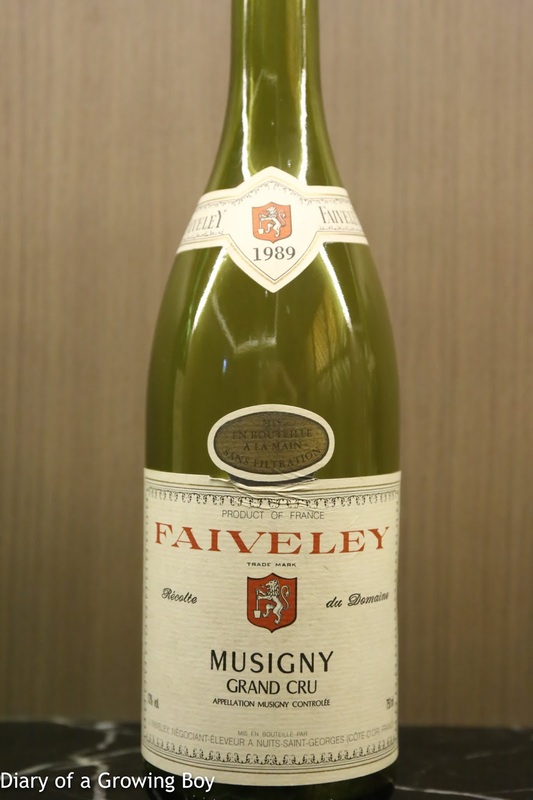 Made with chardonnay grapes from En Busigny in Meursault, from vines planted in 1957. 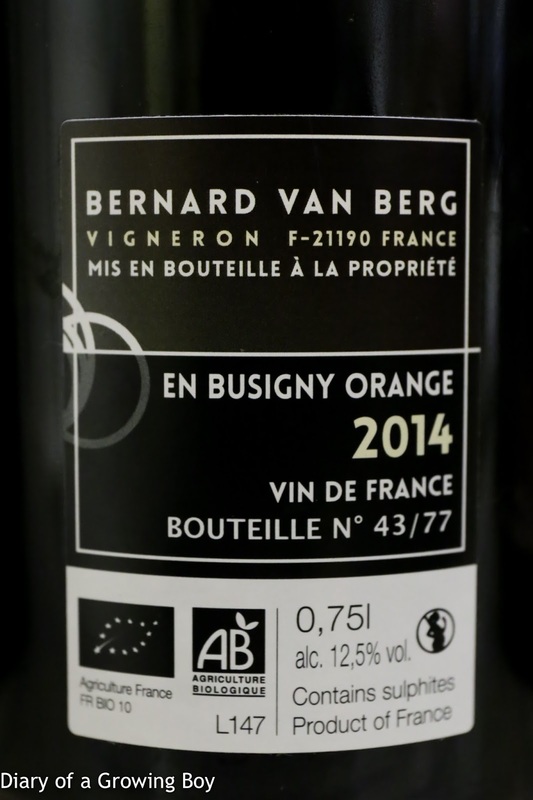 2014 Bernard Van Berg En Busigny Orange - opened 3 hours prior to serving. 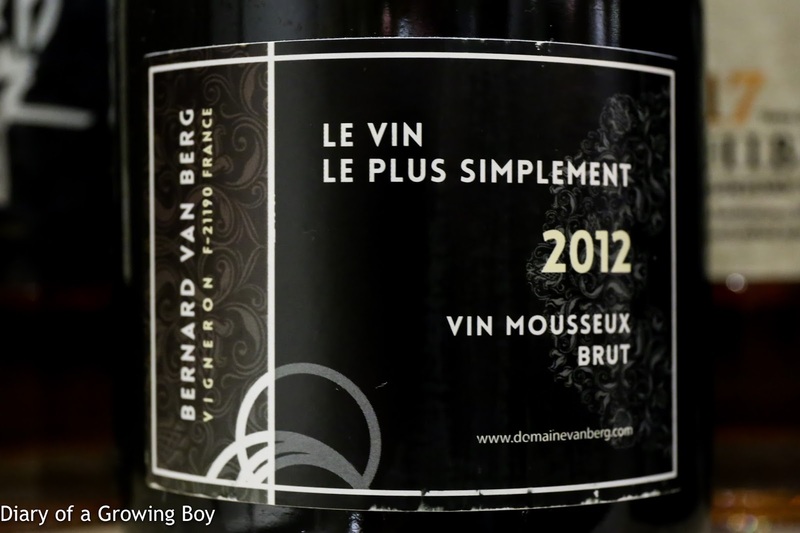 The entire production of 2014 Les Echelas was turned into vin orange, which was originally meant to be the reverse of blanc de noirs. Nose was pungent with lots of brett, showing typical hospital disinfectant notes... almost like a peaty whiskey from Islay. With savory and mineral notes. Not a fan, and I don't think I was alone. 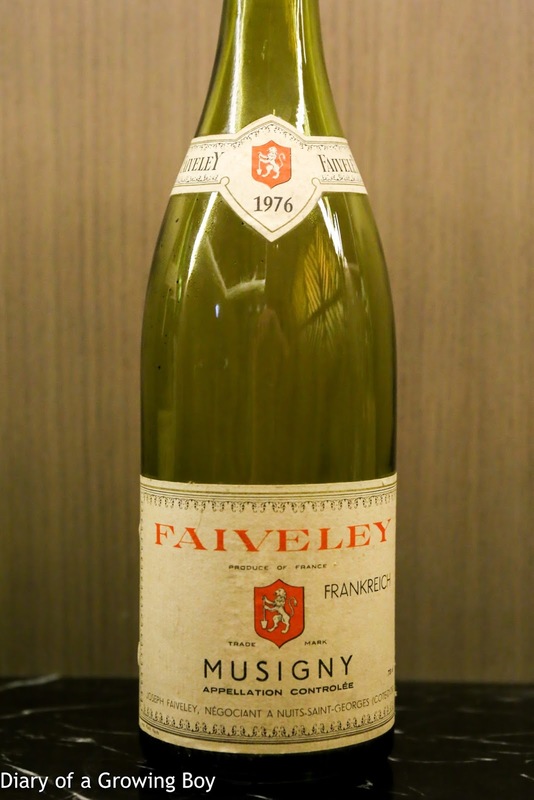 Made with chardonnay grapes from En Busigny in Meursault, from vines planted in 1957. 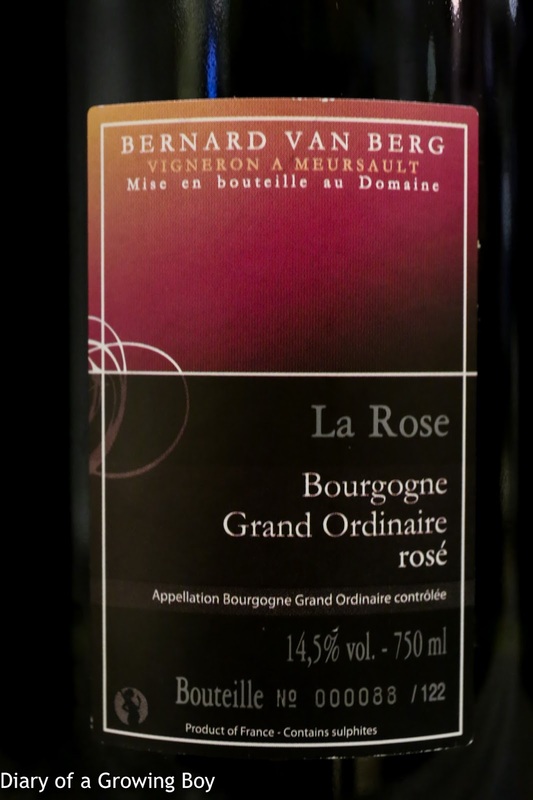 2006 Bernard Van Berg La Rose Rosé - opened 3 hours prior to serving. Originally meant to be blanc de noirs. Pretty ripe and very sweet on the nose, with sugar cane notes. Slightly longer on the finish. 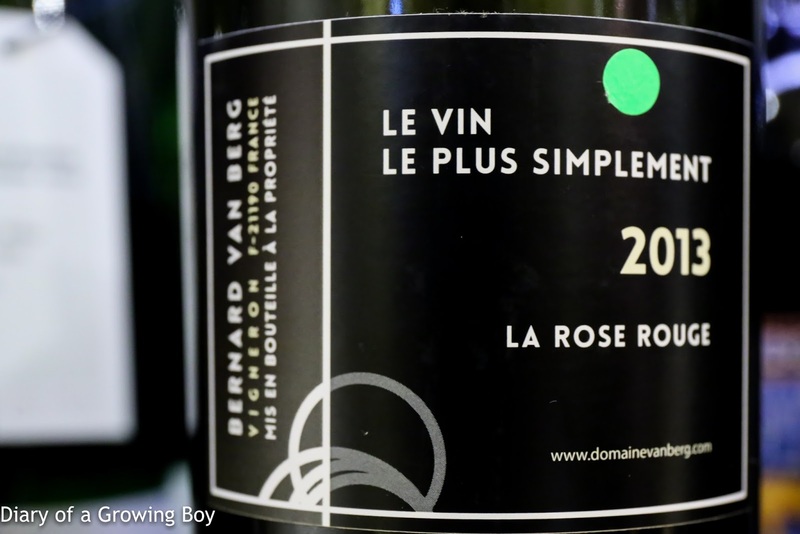 Made with pinot noir grapes from En Belles-Roses in Meursault, from vines planted in 1957. 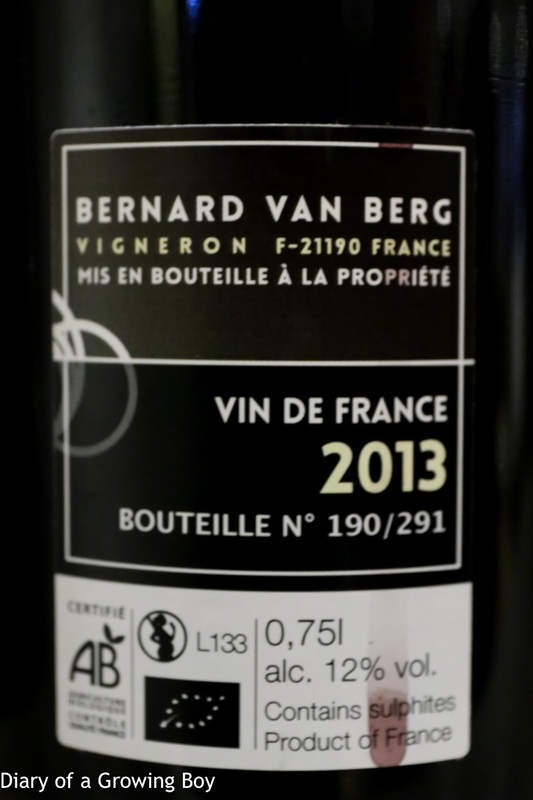 2013 Bernard Van Berg La Rose Rouge - opened 3½ hours prior to serving from decanter. A little animal and leather in the nose, fragrant and toasty. 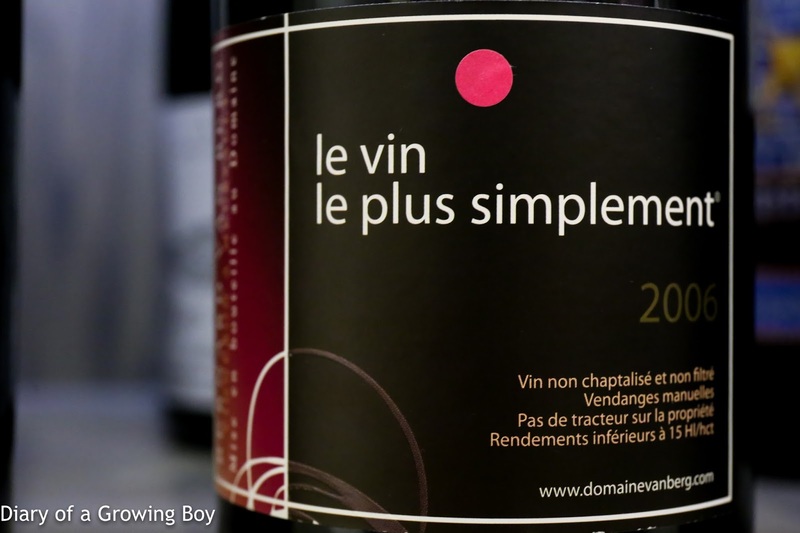 Made with pinot noir grapes from En Belles-Roses in Meursault, from vines planted in 1957. 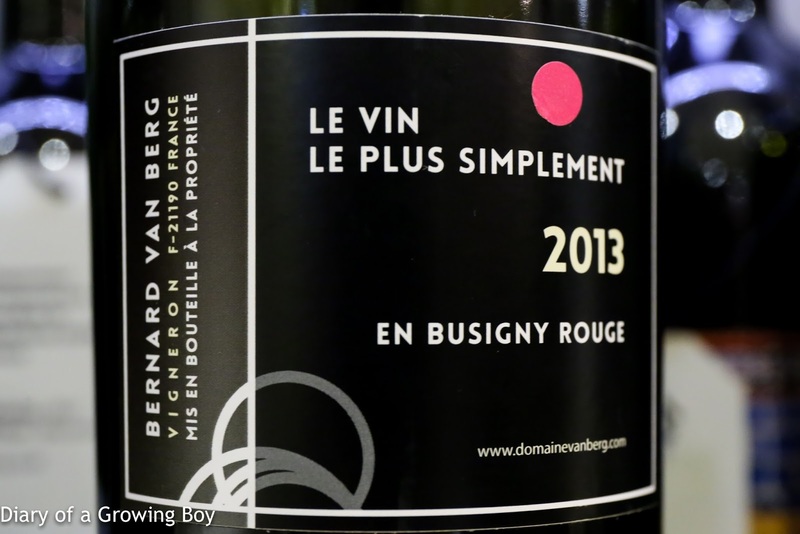 2013 Bernard Van Berg En Busigny Rouge - opened 3½ hours prior to serving from decanter. More concentration, with more animal notes. Pretty toasty, ripe, and fragrant nose. 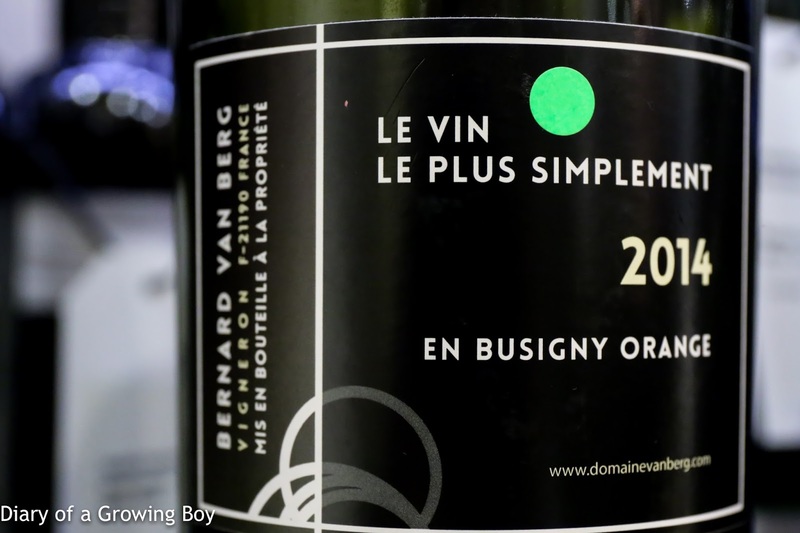 Made with pinot noir grapes from En Busigny in Meursault, from vines planted in 1957. 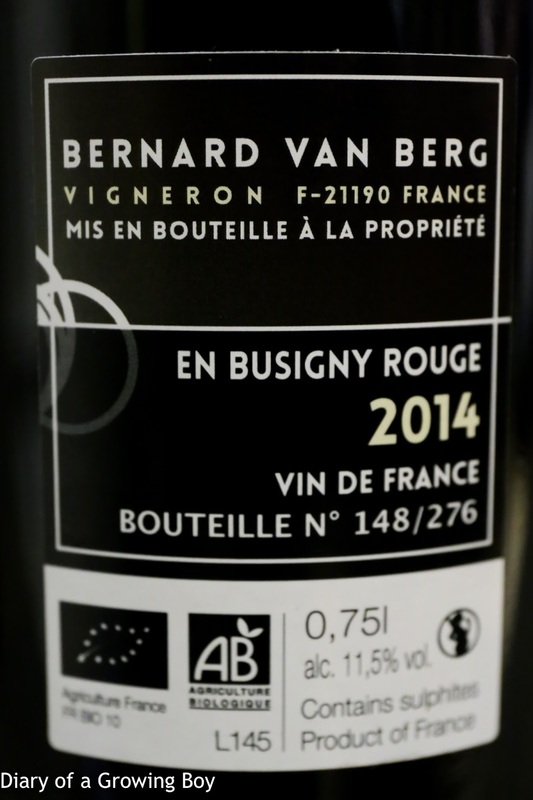 2014 Bernard Van Berg En Busigny Rouge - opened 3½ hours prior to serving from decanter. Also toasty on the nose, a little more pungent. Pretty big and muscular. 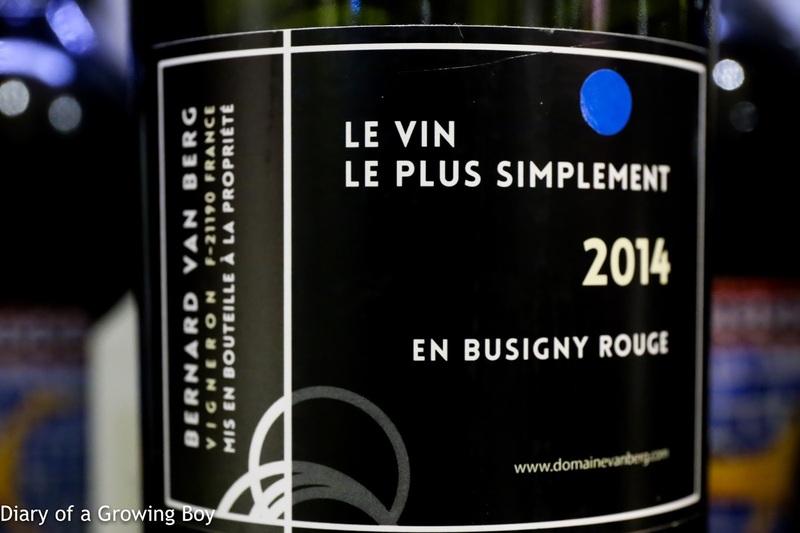 Made with pinot noir grapes from En Busigny in Meursault, from vines planted in 1957. 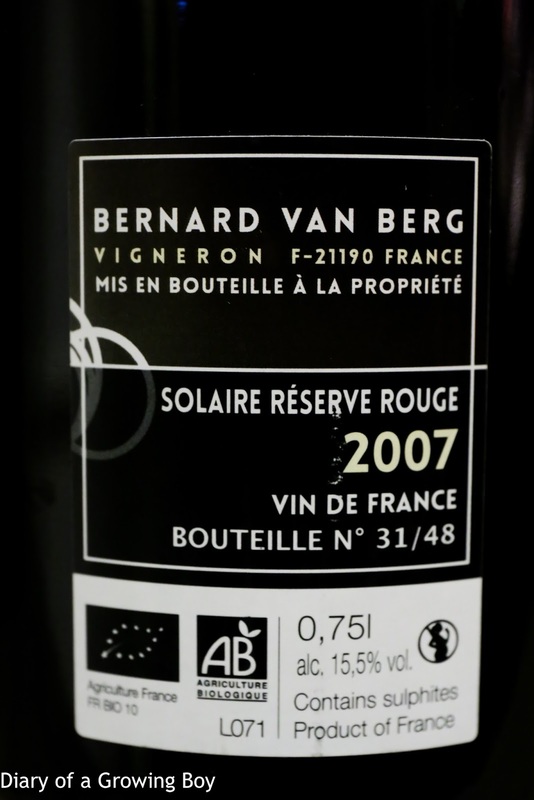 2007 Bernard Van Berg Solaire Reserve Rouge - opened 3 hours and 45 minutes prior to serving from decanter. 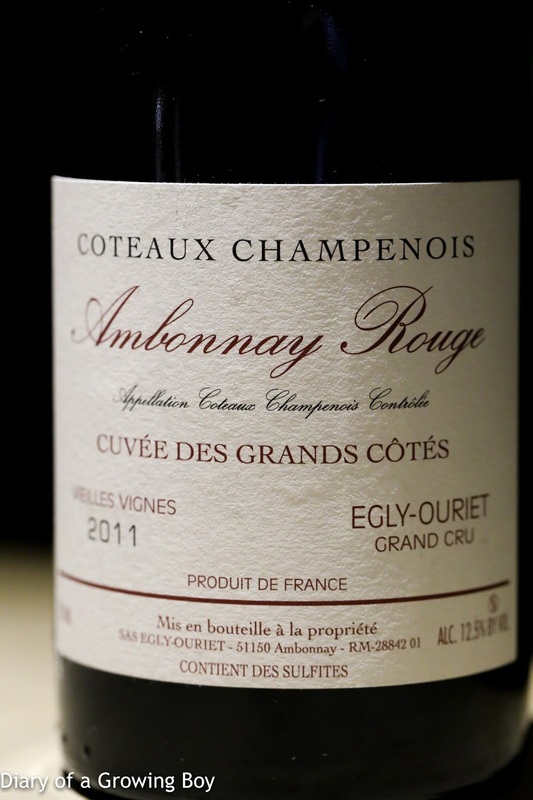 Made with only free-run juice of pinot noir grapes from En Busigny in Meursault, from vines planted in 1957. 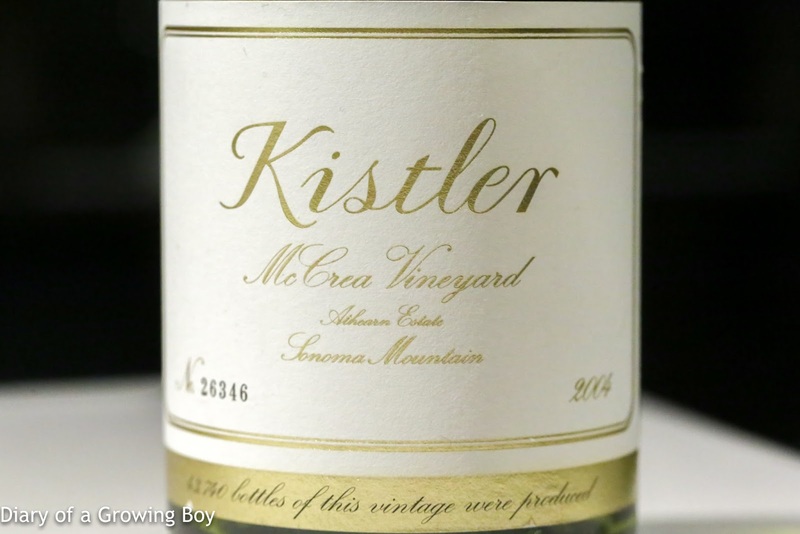 Stunning nose with heavy toast and sweet fruit. Very cloudy. Reminiscent of a Prieuré Roch premier cru. Late harvest on November 6, 2007. Some final thoughts: we were told that Bernard's wines are meant to be enjoyed NOW, while they're young. They are picked very ripe, and this is especially evident in the whites - where the acidity was extremely low. Honestly I wasn't a fan of most of the whites. 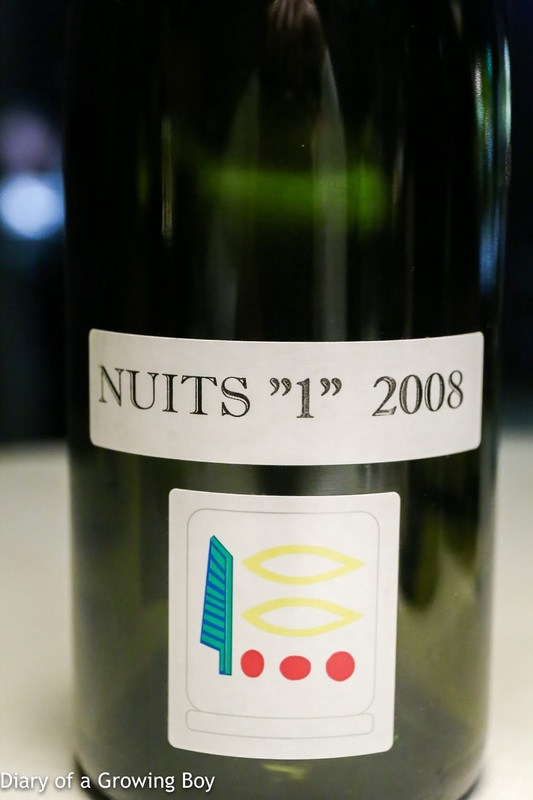 I will admit that the nose - even for the aligoté wines - were much more explosive and interesting than I had expected. The problem for me was that the palates were simply too flat, and the finish on some wines was very, very short. The sole exception tonight was the En Busigny Blanc. 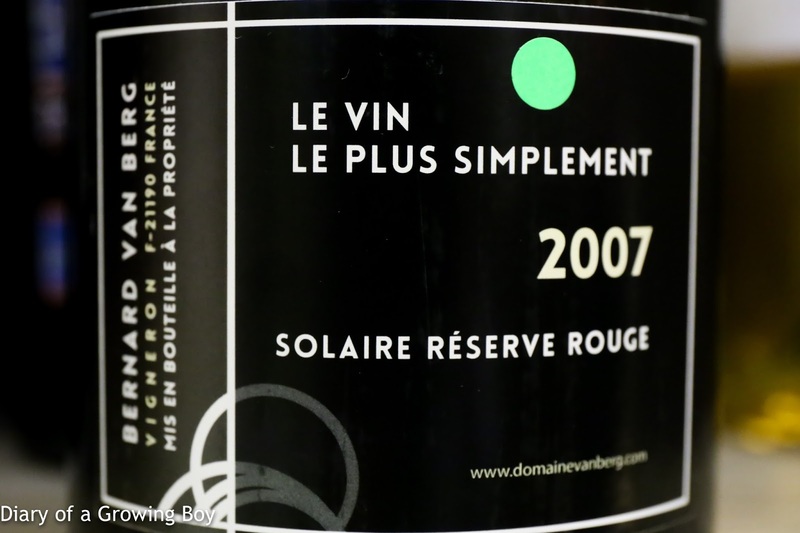 The reds fared much better in comparison, and I do have to say that I was stunned by the Solaire Reserve Rouge. The pricing for this wine was significantly above the other reds, but I would probably still bite the bullet and get myself a bottle. But there's always a next time! 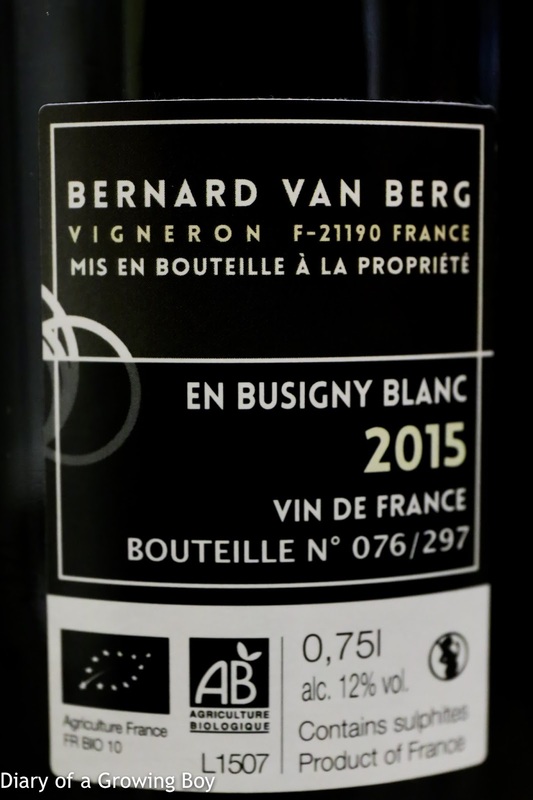 We've already agreed to participate in a "Bernard Van Berg versus the world" tasting - where we pitch one of the Van Berg wines versus another wine which is deemed to be similar in quality... and blind taste them. I can't wait!! 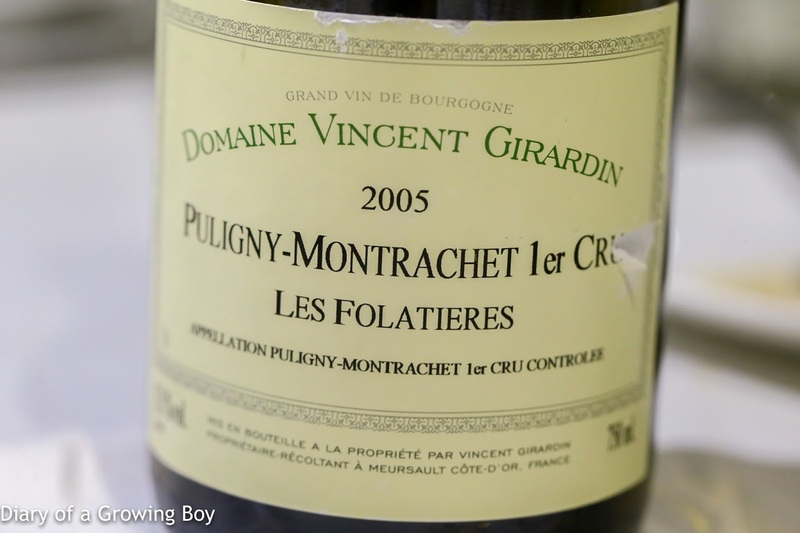 2005 Vincent Girardin Puligny-Montrachet 1er Cru Les Folatières - very mature and oxidized. Obviously a very ripe vintage, but maybe overripe. Nose was very sweet, very grassy with notes of straw, and almost sugarcane. 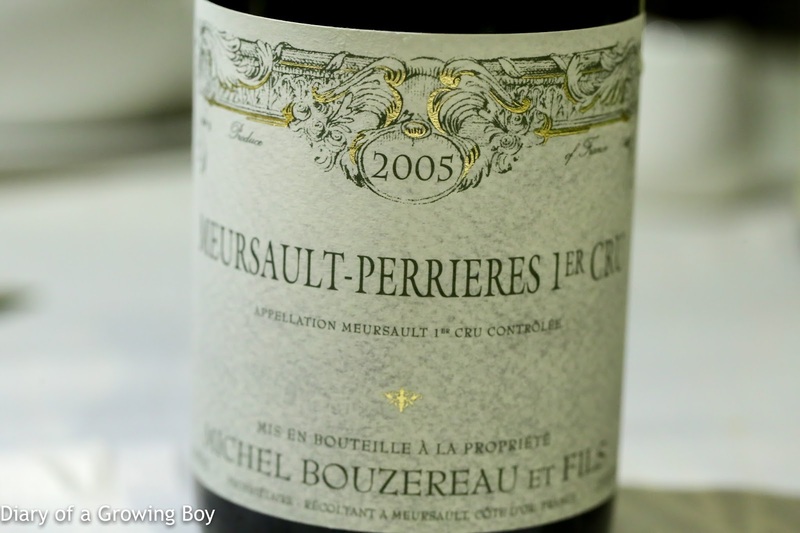 2005 Bouzereau Meursault 1er Cru Perrières - fairly ripe but a bit more mineral and flinty, a little buttery, with some honey notes later. 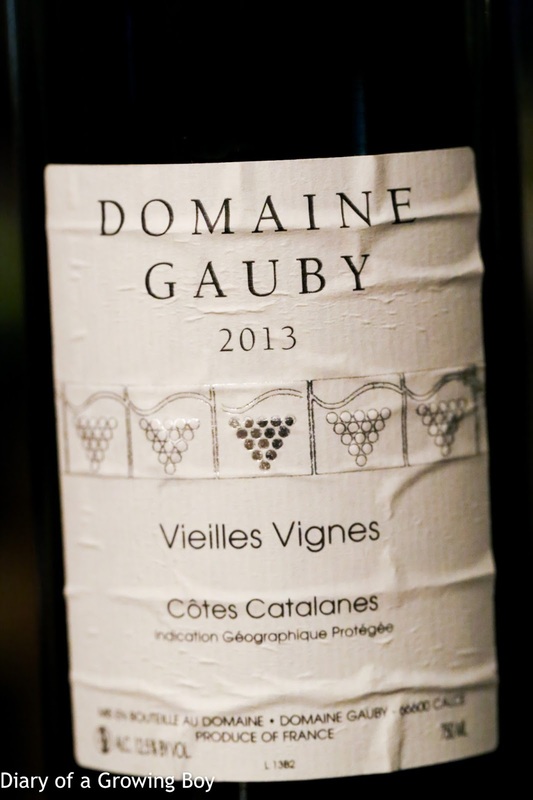 2013 Gauby Côtes Catalanes Blanc Vieilles Vignes - decanted and vigorously swirled in the decanter to speed up aeration. Very cloudy due to extended skin contact and non-filtration. Initially it smelled like cider and a little pear. Ripe on the nose and a little honey, but also has a little pungent side to it... a little jarring and elements not integrating well. Pretty short finish. 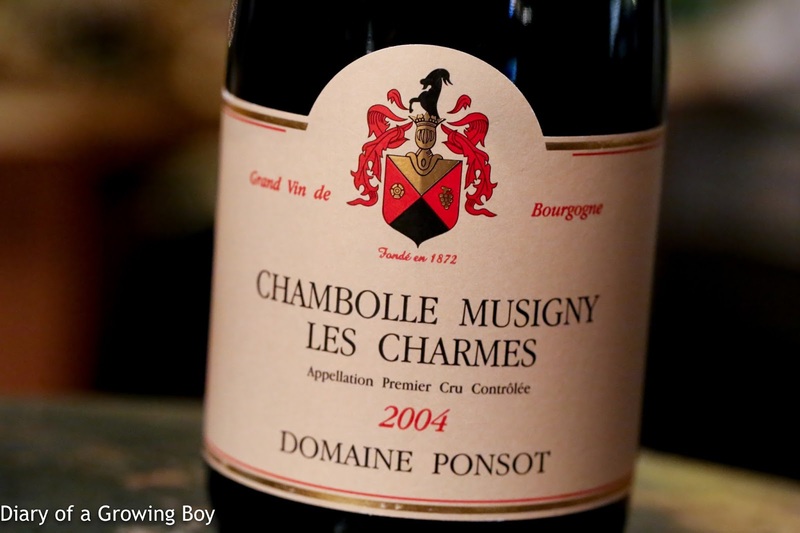 2004 Ponsot Chambolle-Musigny 1er Cru Les Charmes - opened for 1½ hours prior to serving. 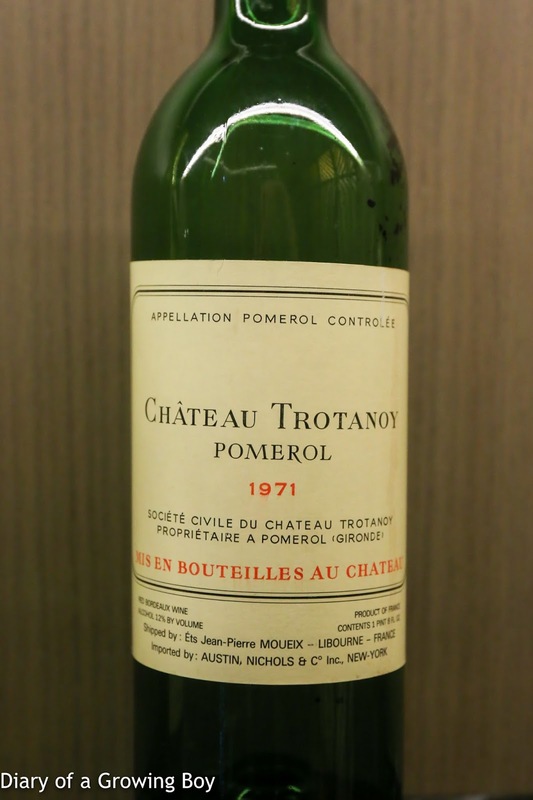 Very fragrant nose with nice fruit, very sweet. After 2 hours the sweetness in the nose intensified even further, but the palate deteriorated and was no longer pleasant. 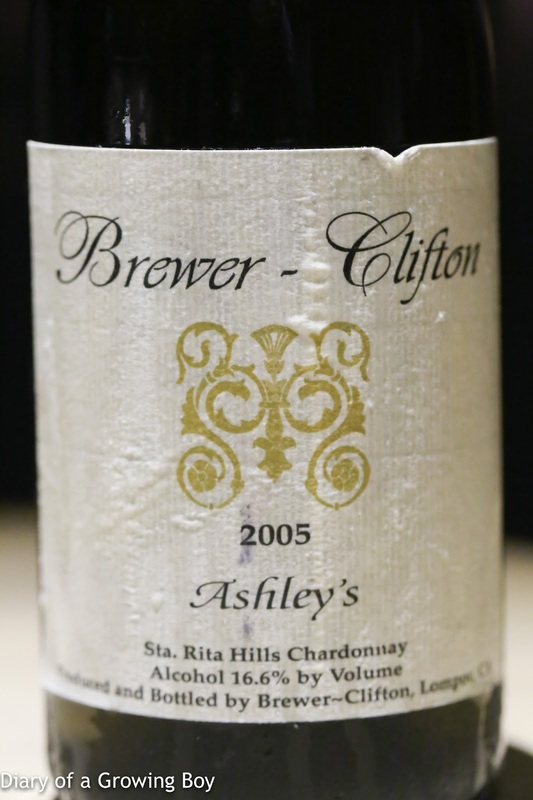 2005 Brewer-Clifton Chardonnay Ashley's Vineyard - pretty powerful nose, with some toasty notes. Ripe, hot and alcoholic on the palate. Later on I definitely noticed the pungent sulfur. 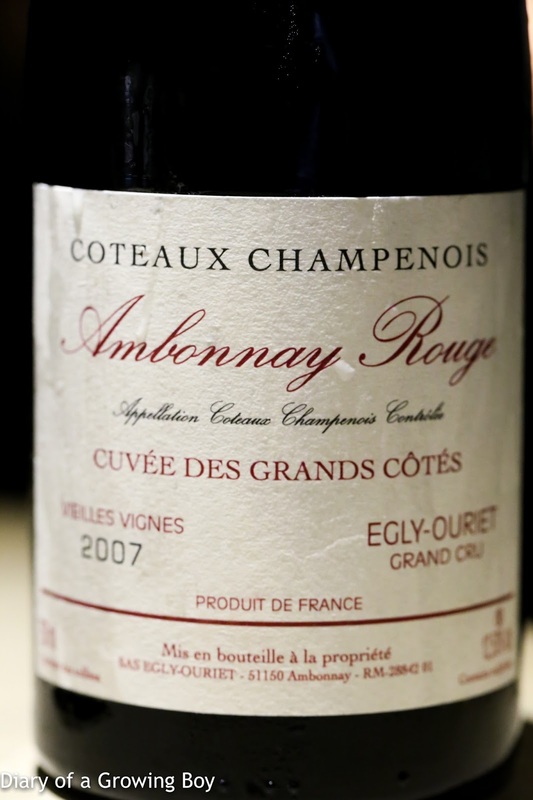 2007 Egly-Ouriet Cuvée des Grands Côtes Vieilles Vignes - opened for 1 hour prior to serving. Lovely nose showing floral and leather notes, with exotic spices as well as some toasty notes later. Very fragrant and elegant wine. 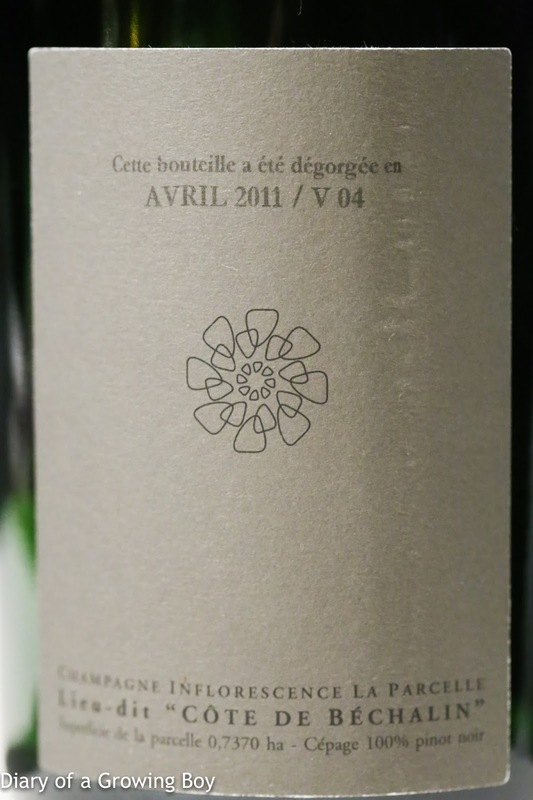 2011 Egly-Ouriet Cuvée des Grands Côtes Vieilles Vignes - opened for 1 hour prior to serving. Much more toasty on the nose, with sweet fruit. After 1 hour and 45 minutes, the nose really opened up and became a little softer. 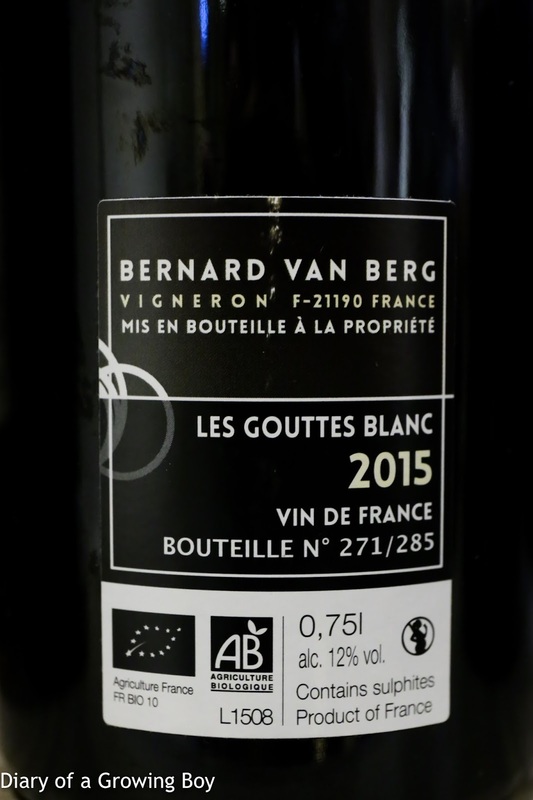 2009 Bernard Van Berg Les Gamets - made from Gamay vines planted in 1957, with a production of just 269 bottles. Opened more than 2 hours prior to serving. 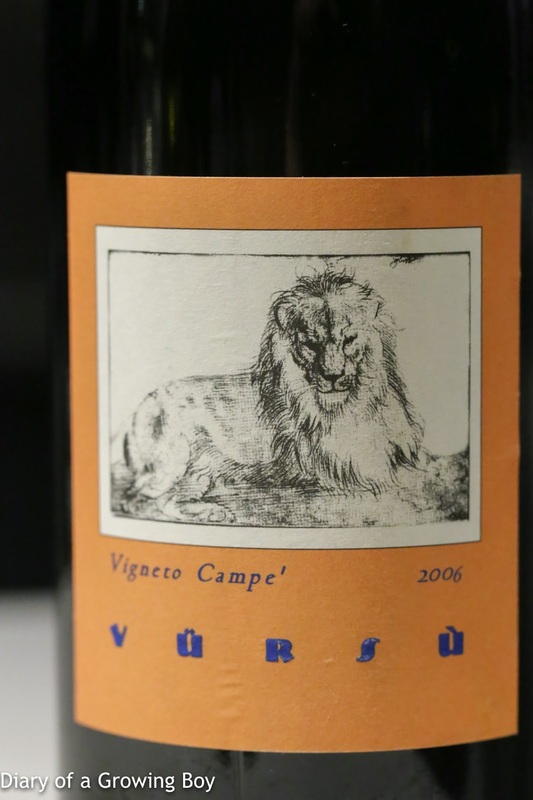 Intense nose of toasty oak, with lots of grilled meats as well as animal notes. Pretty smooth on the palate. A very nice wine, if somewhat lacking in complexity. 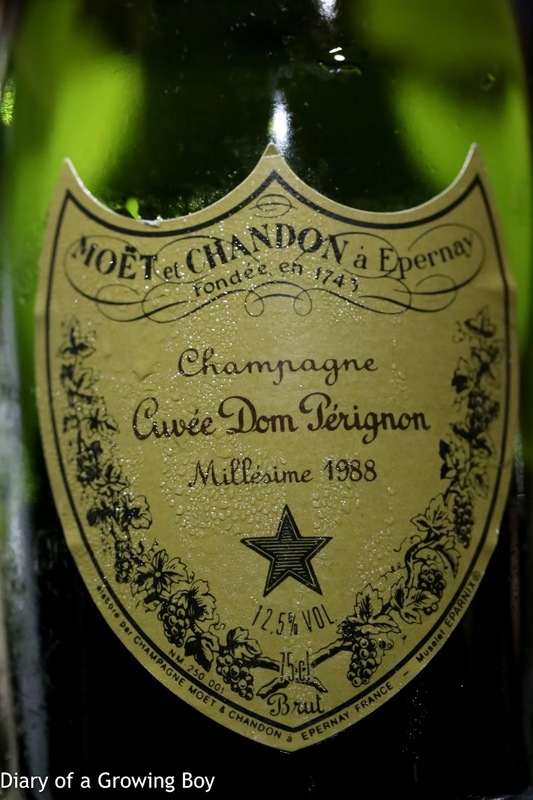 1988 Moët et Chandon Cuvée Dom Pérignon - really ripe, with straw, a little savory and almost like black truffles, along with salted plum and Chinese licorice. MNSC Dinner at The Chin's, hosted by Juliano. Dinner at The Georg in Beijing.